Ahead of the launch of the new Galaxy S8, Samsung announced that it wants to start selling refurbished Note 7 handsets in some markets. It's a move that could easily draw criticism, but is probably a smart one in the long run. When Samsung's Note 7 went on sale in September last year, it did so to critical acclaim from reviewers and early adopters, and as a result, it went on to sell millions of units around the world in the few short months it was on sale. That was good news for Samsung, until the devices started exploding and catching fire. The fumble in how the company handled the initial recall and the Note 7 smartphones' subsequent removal from market, once it became clear its fix hadn't worked, only compounded the situation. It's a public relations and brand trust disaster for a corporate behemoth such as Samsung, which is why the company has been running ads on TV aimed at reassuring people that all its products are tested thoroughly and that it's upping its quality control processes. Ultimately, damaging as it was for Samsung - estimates have pegged it at $4 to $5 billion - it's not an insurmountable problem. It has just launched a new handset and the world has moved on, so why choose to revive a phone that's caused so many problems already? Simple: it has millions of them sitting in warehouses and has categorically identified the errors that led to the problems. The options in that situation are to either reclaim any parts and recycle as much as you can from each device, or attempt to get approval to put them on sale once again. It was clear from the announcement that Samsung knows it's not going to be successful with that aim in all countries, but where it can, it makes sense to try and recoup some of those costs. Perhaps it can even convince wary buyers that the phones are indeed safe, and that Samsung really did find the specific cause. Needless to say, a recall of refurbished handsets would be an utter disaster in brand terms. As well as potentially recouping some revenue, it's also the more environmentally-friendly option - recycling components would ultimately lead to more processing and more waste - which is another positive for Samsung's PR department. It looks, however, like the US isn't on a list of potential countries that might get the device, according to a statement given to The Verge by Samsung. For all the logic behind the move to try and get some of those Note 7 handsets back on the shelf, even if successful in some markets, Samsung's still going to have some problems to overcome. Firstly, Note 7 handsets have been banned by most airlines, whether switched on or switched off, so it'd need to effectively confirm with each of those airlines that the refurb devices are safe and that travellers should be allowed to take them onboard. There would also need to be a sure-fire way of differentiating a 'safe' handset from an unsafe one that was never returned, and it would need to be something that couldn't really be replicated by anyone trying to unload an old handset on eBay, though most were returned. One potential way around this is to redesign the devices in some way, though this might not be viable cost-wise. If Samsung could overcome these challenges, and likely a few others, there would probably be strong uptake among buyers. Who wouldn't want one of the best Android phones at a knock-down, discount price? While striking in design, if the new Galaxy S8 and S8+ had been a huge upgrade in specs or features, a Note 7 wouldn't still be as appealing a prospect in 2017, but they aren't, and Bixby would likely come to the Note 7 too. Pricing them like new handsets, however, would be game over for Samsung's refurbished Note 7 plan. Do you think that Samsung trying to put the Note 7 back on sale is a bad move or a good one? Let us know in the comments below. I would really love to buy one if and only IF, the price was right. I'm not buying for for a $50 discount, But, $500 or less would make me sit upright. This is motivated by investor greed, and as we have seen in the past, is never a good thing. You are right but greed is usually for financial or other gain. I'd buy one. I mean if the price was reasonable. Think it would have to be under $400 CDN for me. It would b nearly pure profit for them, because these have all been written off already. I'm sure they'd sell out in hours. They should really, really lower the price( under $200.00), and wherever they get to sell it, have a "fire" sale. I still think bring back the Note 7 is a bad idea. Here is why 1. they will be competing with the new galaxy S8's . 2 is basically the same the Note 8 will be out this fall. 3. Any problems with the phone will be a complete disaster for the company like the question asked. 4. They created this problem by not testing it fully out or greed to beat a competitors launch date, live with your mistake and learn. I would bet they will not release it where there is a legitimate legal system in place like the US and Europe in case of problems. PS to Ben Woods, I do not buy the environmental part they are already made and will end up dumped sooner or later. 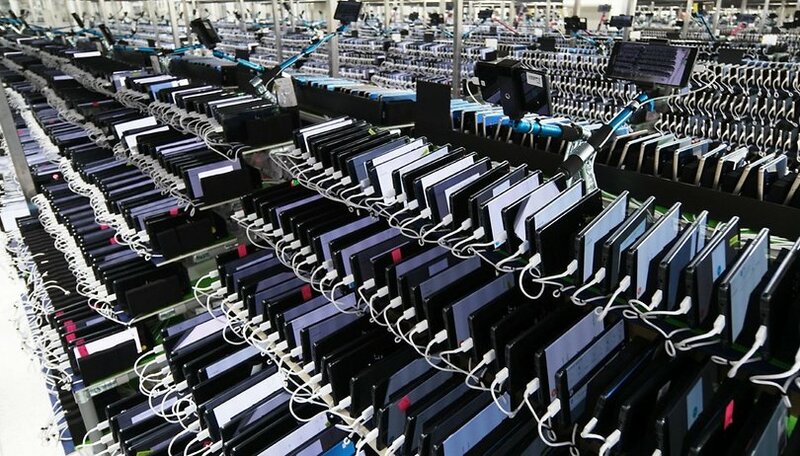 I would say it would be better for the environment for Samsung just to recycle them.